I decided to make a fun new recipes this Easter. And yes, Easter might seem far away and your lenten promise is on the verge of collapsing but this treat might get you in the spirit of Easter. *Disclaimer*: If you gave up sweets for Lent, click away now. I don’t want you to get entranced on the yumminess on this treat ;). Okay, on to the treat. Who doesn’t love an old fashioned chocolate chip cookie? I know I do. Or those amazing chocolate covered (whopper) easter eggs? SOO addicting. Now presenting the original Easter Egg Chocolate Chip Cookie Bars! The bars are super easy and YUMMY. Basicly the bars are made up with the homemade Nestle cookie recipe, for the two cups of chocolate chips, exchange one cup with the (whopper) easter eggs. Not only is it easy to make, but delicious. If family are coming for easter, it is a quick and easy recipe that I can guarantee you, everyone will like. 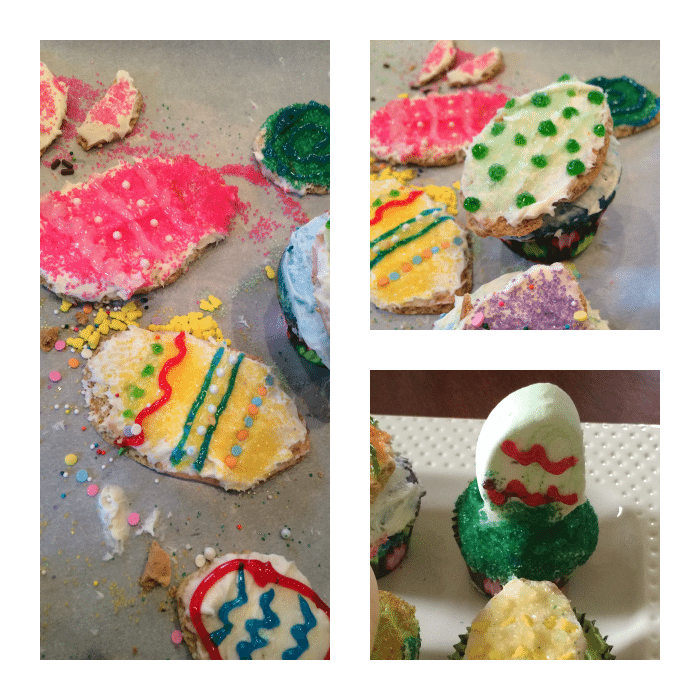 Also you can add your own twist- you can frost ‘em, decorate ‘em, or add more insides to ‘em. You can add the nuts that Nestle suggests, but I didn’t. I hope you enjoy these bars. What Easter tradition does your family love? If you can’t find flat gummies, just buy large size gum drops and flatten them with a rolling pin like we had to. Then cut out the beak and feet with another color. 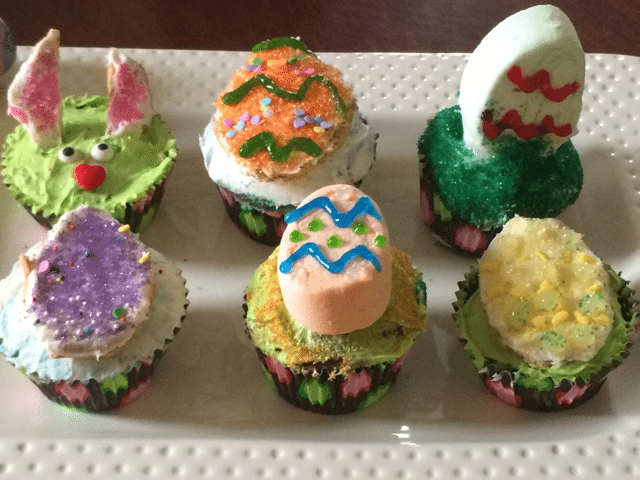 I also want to share some fun Easter Cupcakes my friend and I made Easter Weekend last year so they never made the blog. We used Graham Crackers, and cut them into egg shapes. Then we decorated them to our hearts content. Frosted some fun cupcakes and then added them to the top. 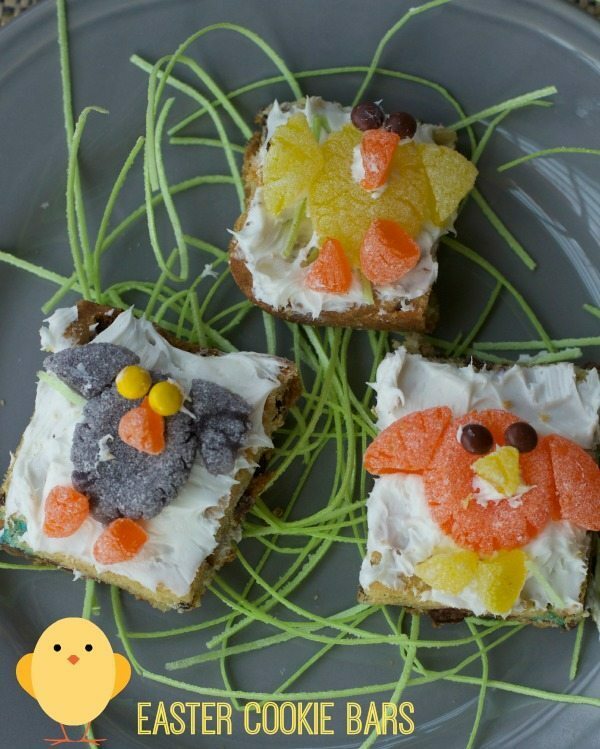 Simple but a fun way to get kids involved in Easter Dessert making. We also had some egg shaped marshmallows for decorations. Also could not resist this adorable bunny cupcake made with marshmallows. My friend and I were getting a little creative in our free time. So creative! These turned out great. A fun project for everyone. These are such clever ideas! 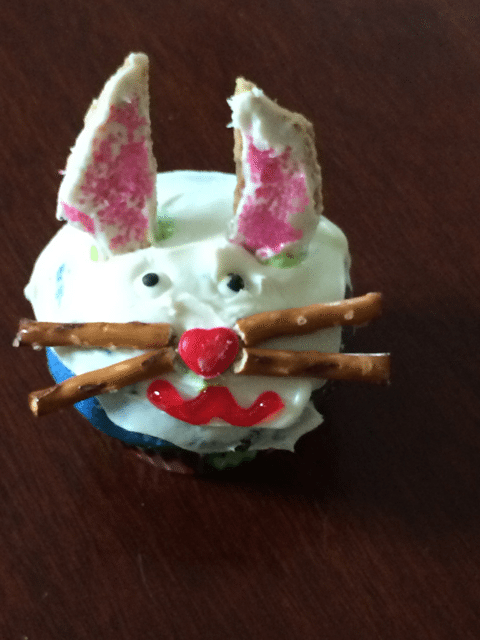 I love the pretzel whiskers for the bunny rabbit! Oh my these are too cute! The kids would love making these! I decorated cakes for years as a profession, but now I enjoy decorating cupcakes so much more. There’s so much you can do with them! Oh how cute. Those look awesome. I love what you did with the gum drops! i wouldn’t have thought of that! These are just so cute and creative. I love what you did with the gumdrops. Everything ended up looking so yummy! My family would love those cookie bars. SO cute too! I love the edible grass on the plate. Such a cute presentation! Oh my how adorable. I’ve been looking for some great Easter treats. These are super cute and I know my kids would love me to make some of these for them. These are super cute and I know my kids would have loved to have me make them. These cupcakes are adorable! I especially love the ones with a bunny on the top! Those look like so much fun to decorate! My kids would LOVE those.